I keep getting more snap peas! 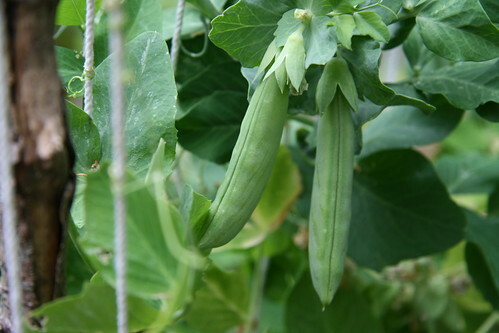 The first crop was great and I never expected the plants to flower again and keep producing peas. 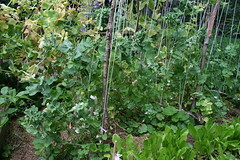 My green shell peas stopped flowering several weeks ago and I pulled them, but these snap peas keep going strong. Wow, I'm jealous....I love snap peas, but the heat does mine in pretty early. What zone are you in? I have snap peas, too, and was planning on removing them after the first harvest. However, just like yours, they have kept on producing. Having never grown them before and reading that they are more of a cool-season crop, I was sure that they'd be done by now! I'm in zone 6a. Hmm, is that warmer or colder than you in zone 6B??? I don;t know. About the same I suppose. My garden has a lot of partially shaded areas. The peas do not get full sun. Probably 5 hours of afternoon sun only. The peas are Johnny's Sugar Sprint Snap peas. Probably a really vigorous variety. I will remember that these are a good one to grow again next year.